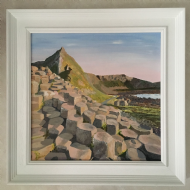 Bernadette is self-taught and teaches painting in Stranmillis University. She currently works in oil and acrylic but is exploring the possibilities of using other media. Inspired by nature, ever changing light and her synaesthesia related senses, she is drawn to vivid colour and strong contrasts of light and dark. Bernadette’s work is also exhibited by Gormley’s Fine Art, Belfast.